Today the Replicators finally disappear for good and then the Wraith try to replicate themselves. The Expedition teams are on near constant Search and Rescue missions attempting to evac as many groups from the Replicator path of destruction as possible as their scorched earth tactics pick up speed, with one team getting caught up in the fire as a settlement being evacuated is hit hard. Soon however both the Daedalus and Apollo arrive on the base to discuss a plan on eliminating the Replicator threat. It turns out that the original plan had been to use an Anti-Replicator device on a massive scale but so far the science team have been unable to come up with anything. Instead the secondary plan is to destroy Replicator ships as fast as possible with the new Asgard weaponry on their ships to cut the threat back and keep it contained. Issues emerge however between Meredith and Ellis regarding their competing plans. Meredith and the Wraith are however given an extra 10 hours to try and finish the science team’s plan but are still unable to. Pretty soon the USAF plan goes into action and the two Tau’ri ships begin cutting down the number of Replicator ships. 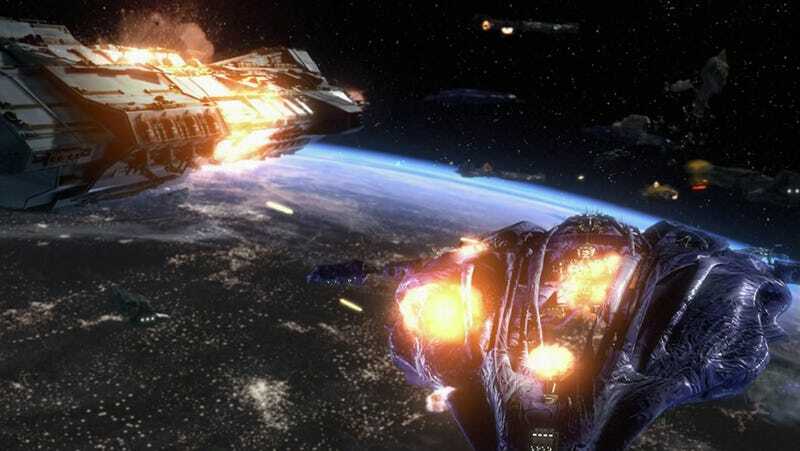 A week into the offensive however they find that the Replicators have begun to withdraw to their own homeworld meaning that the hit and run tactics no longer work. The Anti-Replicator weapon however still isn’t working which leads Meredith to a brainwave in that instead of the previous breaking the links between Replicator blocks down they should instead increase the link and cause all blocks to join together and crush themselves due to the density as a result. The plan however will take time to stop the Replicators in orbit which means they’ll need more ships. The Wraith on the city however agrees to try and recruit his brethren to the cause to defeat the Replicators. This plan however only brings about half the ships needed for the plan to work which forces Sheppard to try and get the remaining amount required from the Travelers when they suddenly showup to see what was happening with the Wraith. On the city Meredith’s plan to use a small number of Replicator cells to kickstart the attraction process isn’t working as expected when the blob keeps failing to hold together. When left along he instead decides to go rogue and builds his own fully functioning friendly Replicator to use as a platform for the code, FRAN. FRAN once allowed as part of the plan soon begins helping the science team to complete their plan however, this time detonating the giant blob with the help of ZPMs to destroy them and the planet for good. The rest of the team are hit by complications too when Teyla reveals she’s pregnant, forcing Sheppard to remove her from active duty for safety issues though Ronon is far more caring and considerate. Soon the Allied fleet meets up and begins its jump directly over the Replicator where it soon takes out an initial group of ships before engaging the rest. Meanwhile FRAN places herself at the heart of the city to begin drawing in the other Replicators while Meredith beams in to overload the ZPMs. Soon the plan begins to work just as intended as the Replicators begin to attract each other towards the giant blob forming on the surface. Unfortunately however the blob grows so large it collapses the power grid preventing the ZPM explosion. Instead however they increase the density of the blob further which causes it to sink to the core of the planet and destroying it in a climactic explosion. In the aftermath of the successful mission all sides go back to their old stances and Meredith gets to remove the Asuran homeworld from their database to his glee. Unknown to all however a lone Replicator ship has survived, commanded by a Replicator Weir who ominously says they can “finally begin”. So here we are at the end of the Replicator arc for the show and once again they go out with a serious bang in what was probably the best action packed episode outside of The Siege, Part 1. The story of the episode is fairly simple and this definitely helps keep it focused given what it tries to accomplish in it. Unlike the previous episode where the plot quickly became a rushed mess as it tried too much too fast here the two main plotlines of FRANs development and the building of the grand coalition slowly dovetail into one that in the end becomes probably the most spectacular space battle we get on the show as dozens of ships open fire on each other. This dovetailing however isn’t without its issues, Teyla’s pregnancy reveal being the main victim, as some lingering side plots get the barest of touches as we focus solely on the main ones. It’s definitely to the benefit of the main story but it’s still a shame it had to happen when an extended episode may have helped solve it. Talking of the big space battle you can easily see why this season had so many “tales from the city” episodes compared to previous ones as the visual effects are constant and of insanely high quality even a decade later. The space battle goes on for almost 10 minutes and throughout remains exciting and visually interesting as we see the big ships firing at each other while the fighters dart in and around striking at the weak points. The fight goes on just long enough to be satisfying for what is a plot two seasons in development but not too long as to outstay its welcome. The visual effects for the Replicator city are also fantastic though the Replicator blob did start to get a bit more hilarious than threatening towards the end of the episode, though this is more a slight misstep than serious problem. Despite the serious arc ending gravitas of the plot there is surprisingly little character development shown in the episode with them instead playing out previously established issues such as the conflicts between Ellis and Meredith along with Meredith and Todd whilst not forgetting Meredith and Zelenka. If there’s any little aspects of it however it’s definitely that of one time character FRAN. After how many seasons of seeing Replicators of nothing but mindless evil it’s a nice change to see a humanised version of one and what they could’ve been if not for their nature as a thing of war. This goes so far as to seeing people get attached to her far more than they should, with Meredith worried about her impending death. Again it’s a one shot character who should’ve appeared more. Overall however is a fantastic fast paced episode that does what it wants to do and does it well, providing a satisfying conclusion to an arc on a show that’s had a few duffers up to this point. · They really didn’t hold back from stunning Ronon die they. · I’m sure FRAN being an attractive woman is completely coincidental. · So they just phased through the ships? We pickup during the battle over the Replicator homeworld aboard one of the Hives where Meredith’s Wraith lab partner is commanding a raid by a team of Darts that are only recovered just before the planet goes up. Onboard the Hive it’s revealed that the Darts had been carrying stolen ZPMs. Back on Atlantis the team are watching the breaking up of the united Wraith coalition into their old warring factions, thereby hopefully making them less of a threat to the Expedition. One signal however is a tracker they believe to be coming from a single Hive relating to the friendly Wraith who once again may be in need of help. Sheppard decides that they should take a team out to check the signal just in case they can find anything about why his ship is all alone in the middle of nowhere putting out a signal. Arriving via Jumper they find the Hive heavily damaged having been attacked by another Hive and filled with dead Wraith. At the source of the signal however they find the tracker but no sign of the Wraith, who Sheppard has now named Todd. With the ship clear the Expedition decide to try and get it flying again and under their command, accidentally revealing a map to some kind of Wraith facility in the process. Sheppard leaves to bring Teyla back onto the team, needing her to help pilot the ship, only to find when they get back that Meredith wants to take the ship to this newly discovered facility as the ship records suggest it has vital importance to the Wraith cause. With Teyla’s help they’re easily able to get the ship moving and decide to take it to the facility. Remaining in orbit and far away from the facility itself the team minus Teyla take the Jumper down to the planet while Lorne and his team stay on the ship with Teyla. Inside the facility the trio find facilities designed to quickly grow new Wraith soldiers and that it goes on for miles underground, a vast cloning facility left over from the Ancient-Wraith War that allowed the Wraith to quickly overwhelm the Ancient’s technological advantage. Given that the restarting of the facility will quickly overwhelm the Expedition as well the group set about attempting to sabotage it only to instead bump into Todd, who was being held in the facility as a prisoner. Todd happily admits the new controllers of the facility are merely doing what he was going to do for his own benefit though also happily agrees to help the team shut the place down as well. This plan is cut short however when the group are overrun and captured, though Todd is able to avoid being jailed again. Meanwhile in orbit Teyla and Lorne begin to grow restless about the lack of comms from the team only for a lone Dart to appear on sensors. Initially fearing that it’s the Wraith it turns out to be Todd who’d escaped from the facility. Todd fills them in on what happened on the surface and suggests leaving to fight another day only for Teyla to instead use her mind powers to take over the Queen on the base just as she’s interrogating the team. Using her tenuous control of the Queen’s body Teyla is able to free the rest of the team from their cell. By now however the facility has been made fully operational meaning that they don’t have time to pull the ZPMs and instead have to fight their way out once more. Retreating to the Jumper and getting back to orbit Sheppard has Teyla put the Hive on a kamikaze heading towards to facility before picking up everyone from the Hive before it crashes while Todd takes the Dart and splits off. With the facility now destroyed the team head for home. Back on Atlantis Sheppard and Teyla have a heart to heart where Teyla admits she finds it hard to deal with both her place with the Expedition and now protecting her child. In some ways I find it weird how this episode is listed as being part of the Replicator arc when very little seems to relate back to it but in others it really does round up some of the personal issues between the crew brought up in the previous two episodes that until now have remained unresolved, the chief beneficiary in this regard being Teyla. The story itself places Teyla around the fringes for much of the length before suddenly thrusting her at the centre of the piece when times become dire and she’s needed to save the day with her ability to connect with the Wraith mentally. This seems to be a deliberate choice as it reflects her journey of the last few episodes as she’s been stuck on the outsides due to her inability to decide her own future path between protecting her own child or staying with the team as both remain core to who she is. It’s only when everything she cares about is put at risk that she realises that it won’t be as simple as choosing one or the other but balancing the two together. Still however the episode struggles at times to give her the closure she needs what with the rest of the plot going on, with Sheppard and Teyla getting 2-3 minutes at max to clear the air. For a plot they deliberately wrote in to deal with Rachel Luttrell’s pregnancy it wasn’t half-baked at times. Elsewhere we also get a major addition to the backstory of the downfall of the Ancients and the rise of the Wraith in the form of Todd’s descriptions of the war between the two. Atlantis has long put the Ancients as cocky idiots who caused their own destruction and now we have that plain as day when it comes to the war as well. The Ancients, sure of victory, sent ships piecemeal into battle and eventually lost the ZPMs that would be used to power the vast cloning facility that the Wraith then used to build their vast armies and fleets. It’s a situation that is similar to many throughout history where previously all-mighty armies and nations have lost easy wars because of pride and stupidity and once again that became prevalent in the Ancient way as well. This arc really is the last time we come across the Ancients in real depth on Atlantis, their story and final mistakes now born out for the team to witness and the final breaking down of the All-Mighty creator of the Stargate network lain down as the negligent failures they became. Talking of Todd the ending of this arc not only finally gives the guy a name but is also sees him become a good acquittance if not a friend of the team and the Expedition. Despite the constant restraints we’ve seen in the past over the course of the arc we’ve seen him slowly lose those and be given surprisingly lax access to the base and being around the team, with only a guard or two at most to keep an eye on him. In this episode in particular not only do they go out of the way to check on his distress call and let him go on his way at the end. This is probably the biggest change to the structure of the show since its start, the slow humanisation of the Wraith from simple monsters to individuals with their own thoughts and culture. So there’s the end of the Replicator arc and the closing of a season’s worth of direct storyline, while also signifying the final stage of major changes to the show’s long running mythos. · Finally he has a bloody name. · So this facility has just been hanging around for thousands of years but still just works fine?